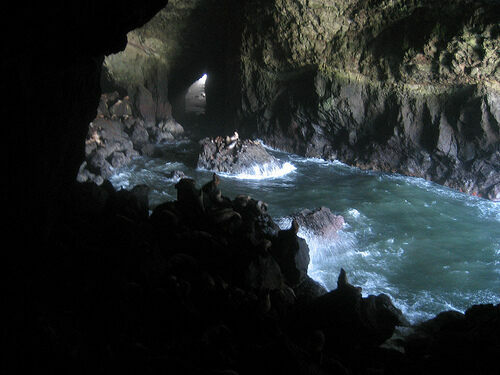 The Sea Lion Caves along the Pacific coast in Oregon are a connected system of caverns where Steller’s sea lions (also known as northern sea lions) gather every spring and summer to breed and give birth to a new generation. This is the only known mainland rookery of the threatened species, which, as the largest of the eared seals, is only inferior in size to the walrus and elephant seal among pinnipeds. Taking the 3D art experience far beyond blue and red glasses. 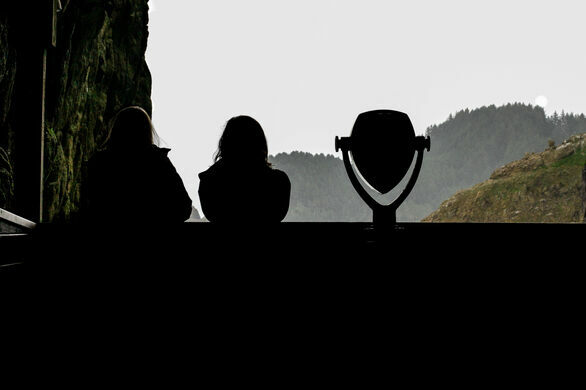 At sea level, the ocean continually washes into the main chamber of the caves, which is about two acres in size with a vaulted rock dome that reaches an impressive 125 feet. The walls of the cavern are stained a rainbow of colors because of the lichens and algae that grow in the dark, wet space. Visitors to the caves enter through a building and climb 37 steps to a series of walkways that eventually lead to an elevator that descends into a viewing area. 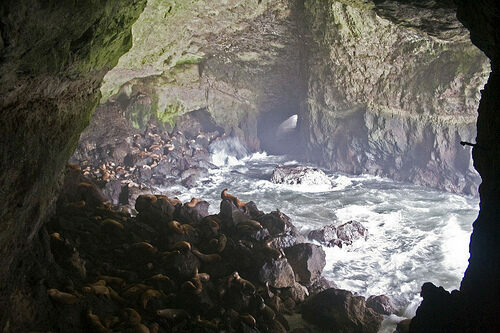 While sea lions are the main attraction, the area also serves as a nesting grounds for the Bald Eagle and Tufted Puffin among other birds. From a whale watching deck below the gift shop, orcas can typically be seen migrating past the entrance to the caves once a year and Grey Whales are almost always in the area. Discovered in 1880 by a local seaman who entered the series of caves on a small fishing vessel, the grotto is often compared to the Blue Grotto on the coast of the island of Capri, Italy, because they are similar in size and coloration. Located 11 miles (18 km) north of Florence on U.S. Highway 101. 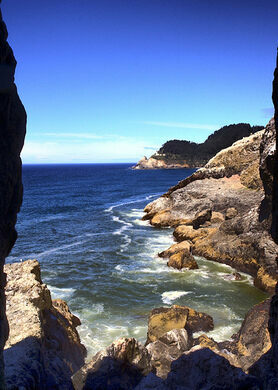 In this area, Highway 101 follows a steep and undeveloped seascape 300 feet (91 m) above sea level. The caves are accessed through a gift shop building. The park preserves a single, rare species of carnivorous plant that spells certain doom for any unsuspecting insects.